The South East Regional Organised Crime Unit (SEROCU) comprises police officers and staff drawn from the services of Thames Valley, Sussex, Surrey & Hampshire. SEROCU works in conjunction with the UK Border Force, HM Revenue and Customs (HMRC), the National Crime Agency (NCA) and the Crown Prosecution Service (CPS) to combat cross-border organised crime. SEROCU provides niche and specialist capabilities in order to effectively target and disrupt serious organised crime. These capabilities are also available to the constituent Police services as required through a tasking process. There is a flexibility in the tasking model to respond to day to day needs. From April 1 2014, the South East Regional Organised Crime Unit was aligned to Counter Terrorism Policing South East with Thames Valley Police as the host Police service for both functions. Thames Valley Police manage SEROCU and provide all financial, HR and organisational requirements. Assistant Chief Constable Jason Hogg works directly to Chief Constable Francis Habgood to exercise overall command of the regional crime and counter terrorism functions. He also represents serious organised crime both regionally and nationally with the National Crime Agency and other key stakeholders. The role of the investigations teams is to investigate, disrupt and dismantle the most harmful serious and organised crime groups impacting the South East region. They take on investigations developed within SEROCU or from other law enforcement bodies and other agencies. They can also provide ad hoc specialist support to other ROCUs or law enforcement bodies. The Cyber Crime Unit provide specialist capabilities in investigating complex and cross-border cyber investigations. They regularly work with international law enforcement partners in the prosecution of cyber criminals. They also provide support to the Cyber Crime Units within each of the constituent Police services. They are supported by an in-house e-Forensic unit dealing with digital forensic examinations using the latest techniques. The laboratory is ISO 17025 accredited. The e-Forensic team also support serious and complex investigations that do not involve cyber crime but may have a digital element. The Cyber Protect team provide free cyber awareness presentations to businesses, charities and public service sectors as well as bespoke support to Victims of cyber dependent crime. The Cyber Prevent team work to manage the highest risk cyber offenders post-conviction in order to prevent reoffending. They also deliver the Cease & Desist programme for those committing low-harm cyber offences with a view to positive diversion rather than prosecution, and are working with partners to develop wider messaging to young people about the Computer Misuse Act and opportunities in cyber careers. 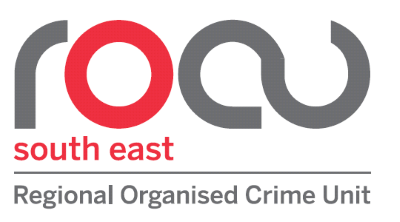 The Regional Fraud Team provides a dedicated fraud capability which conducts investigations against Organised Crime Groups (OCGs) or individuals identified as being involved in high level fraud activity impacting on the South East Region. The nature of the investigations is often complex, time consuming and requires a high level of investigative expertise. They work closely with other ROCU capabilities and reactive fraud investigation resources including the Serious Fraud Office (SFO), City of London Police (CoLP), forces and other agencies to provide a comprehensive attack on fraud offending. The Regional Fraud Team will further disrupt OCG members by stripping them of their assets at the conclusion of the investigation. The Asset Confiscation Enforcement Team (ACE) were established to assist HM Court and Tribunal Service (HMCTS) and the Crown Prosecution Service (CPS) to enforce confiscation orders obtained by all law enforcement agencies to maximise the disruptive impact on criminals. They achieve this by recovering assets to compensate victims and to remove criminal capital from the economy. The team work within the South East Region to encourage compliance with confiscation orders and assist in enforcing and improving the management of such orders. By doing so they maximise the disruptive impact, deter criminals from involvement in criminal activity and in consequence improve the public’s confidence in the criminal justice system. The Regional Asset Recovery Team work to provide financial intelligence and investigation development in support of operational activity. They also provide a cross agency response to money laundering to disrupt organised crime threats. They provide a core function of the confiscation and recovery of assets which relate to the proceeds of crime. They work with the SEROCU Investigations Team to tackle serious and organised crime by utilising the full provision of the Proceeds of Crime Act (POCA) in order to disrupt and dismantle Organised Crime Groups. The Regional Intelligence Bureau (RIB) is part of a national infrastructure set up to provide a single intelligence picture of the threat posed by Serious and Organised Crime in the South East. This drives operational business and helps develop opportunities for enforcement activity. The Regional Intelligence Bureau embodies partnership working and resources from a multitude of law enforcement are embedded within the unit. This strengthens the ROCU’s capability when tackling cross-border criminality whilst being able to sharing expertise and intelligence to greater effect. This enables all partners to identify, assess and manage the threat from Serious Organised Crime by bringing together intelligence and operational assets and processes capable of delivering an effective response from local, to national and international. The unit can link into national and international portals through its contacts within the NCA and with other Regional Intelligence Units across the country. The Regional Protected Persons Unit protect and care for people who are considered to be at real and immediate risk of serious harm. The South East Protected Persons Unit is the regional delivery arm for the United Kingdom Protected Persons’ Service, having brought together the pre-existing Force Witness Protection Units. The Protected Persons Unit provides specialist support to local Forces and other agencies in the managing of individuals judged to be at serious risk of harm. They operate independently from the relevant Force and as such can provide investigation teams with greater transparency when supporting individuals in criminal proceedings. The unit are supported by the Central Services – a part of the National Crime Agency (NCA) – providing strategic support, practical help and advice to officers supporting ‘protected persons’. There are a number of other specialist units within SEROCU dealing with specialist functions who have a more covert role. Job roles within SEROCU are listed on the Thames Valley Police jobs portal. Click on the link below to go to the website (opens in a new window).